I wanted to take a minute to personally say “Thank You” for choosing the American Hunting Lease Association as your provider for hunting lease liability insurance. I hope you were successful and safe in harvesting whatever game animal you were pursuing. We take great pride in providing our members with the most comprehensive risk management program available and strive to maintain the highest possible value for you. We are now beginning our 5th year in business and our original vision has become a reality. The AHLA was always intended to be more than just an insurance provider and in 2014 we learned what a positive impact we can have. 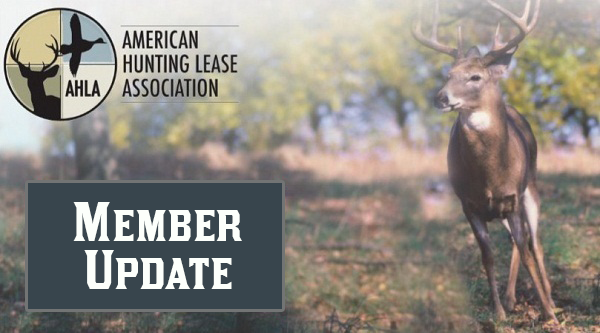 In addition to protecting thousands of hunt clubs, the AHLA successfully argued an important issue regarding licensing and credentials with the State of Illinois. Additionally, hunters and landowners from all over the country now use our website as a resource to learn more about leasing and the benefits a properly executed hunting lease can provide. To continue promoting the benefits of the hunting lease to landowners, and to continue protecting all parties involved, we are offering a paid membership for 2015. Membership in the AHLA will be a modest $29.95 per year and will include a membership package ($50 value) and the ability to purchase an insurance policy. A paid membership will be required for each policy purchased. Your loyalty and trust are very important to us. Therefore, we want to insure the highest possible value in the industry for your membership fee. In addition to the membership package, you will receive a free entry into our AHLA Dream Lease Sweepstakes! The grand prize is a $10,000 Base Camp Leasing gift certificate. If you have always wanted to hunt Southeast Ohio, North Central Missouri or any of the top whitetail states in the Midwest…this is your chance! Other prizes are being added everyday as we build what will be an enormous give-away exclusively for our members. Keeping quality hunting habitat available to hunters, while providing for the landowners interests and promoting your rights to lease and hunt are top priorities for the AHLA moving forward. We are excited to offer this membership to you and are committed to building the most comprehensive resource for our members to locate, maintain and safely enjoy the hunting lease experience. Please have a safe and happy new year. We look forward to serving you again in 2015. "You guys are great! go ahead sign me up another year. Seriously speaking, Thank you for everything."